Asked why she decided on resigning her position as teacher at the Elmore Stoutt High School, Ms deCastro said that she needed a breath of fresh air. “My new business, Write to Read, provides the freedom to work my passion, teaching, from a new and unique position and perspective. I was born to teach, to lead, to inspire, to make a difference. I had an amazing idea and was driven by my will to execute it,” she told Virgin Islands News Online in an exclusive interview. What exactly is Write to Read! 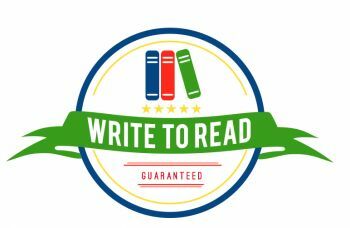 Write to Read is a literacy programme, which aims to supply an academic environment that focuses on an individual’s right to read and write. This programme will serve children of various ages in a learning environment that is critical on Monday to Thursday from 4 pm to 7 p.m. Each child in the programme is required to attend at least 2 days a week with classes lasting one 1 hour each. The programme is a 7 month (28 weeks) in total with breaks for Christmas and Easter. The cost per session is $20 each for a monthly total of $160 and the venue is the 3rd floor of Creque’s building on Main Street. The programme seeks to nurture young readers, meets the challenges of different learning styles and fosters enhanced literacy development in all students. Curriculum and instruction is implemented to increase student reading and writing levels in a positive, safe and secure student-centred learning environment. Instruction will be delivered in the components of reading: phonemic awareness, phonics, vocabulary, fluency and comprehension, as well as the components of writing: content, organization, presentation, voice, word choice, sentence fluency and conventions which include spelling, grammar and usage, paragraphing, use of capitals and punctuation. Yes! There is also an adult literacy focus that seeks to target adults in the community who have reading and learning difficulties and have a desire to better their literacy skills in order to advance themselves, their careers and their lives in general. ESL – English as a Second Language? With the Virgin Islands (VI) being the melting pot that it is, there is a great need in the Spanish community for both children and adults to learn to speak and write in English. Write to Read caters to that need. 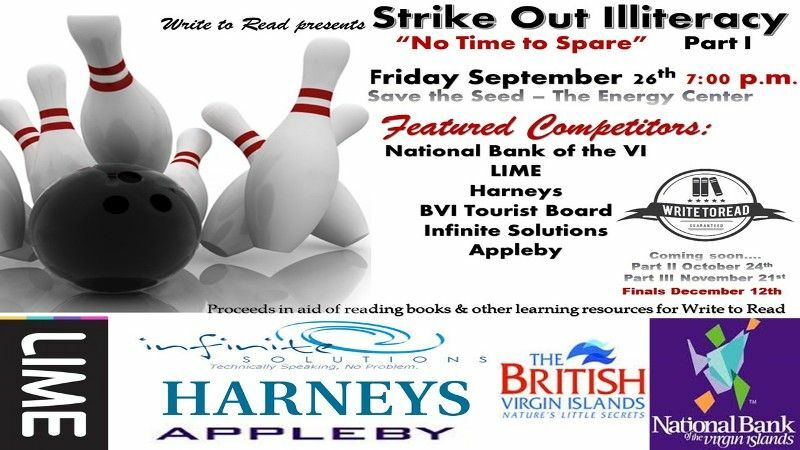 The business launches this Friday September 26, 2014 at 7:00 pm at the Save the Seed Energy Center in Duff's Bottom with a unique fundraising bowling tournament under the theme "Strike Out Illiteracy - No time to spare!" This tournament is opened to all businesses/companies throughout the Territory who have a keen interest in ensuring that illiteracy is eliminated in the Virgin Islands. The tournament is over a 4 month period with 18 companies participating over the first three months and the top 2 from each of the 3 months will face each other in the finals to determine the "Champion of Champions." Proceeds from this event will be used to purchase books and other learning resources for the Write to Read programme. But who will be competing? 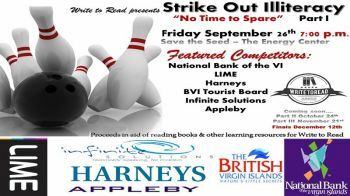 In part one on Friday: National Bank of the Virgin Islands, Harneys, BVI Tourist Board, Infinite Solutions, LIME and Appleby will be competing. Other companies who have confirmed participation in the other segments on October 24, 2014 and November 21, 2014 thus far include Delta Petroleum (BVI) Ltd., BVI Health Services Authority, BVI Ports Authority, Sable Trust, Virgin Islands Civil Service Association and Eureka. There are currently only six more slots available. “I would like to take this opportunity to extend a heartfelt thank you to the companies mentioned for their commitment to help champion the cause of literacy. Your support is greatly appreciated,” she said. Being the person she is she couldn’t conclude this exclusive interview without a word to youths. Sharie B. deCastro represented the VI in many capacities. As an ambassador she wore the crown of Miss BVI for 2012-2013 and raised the flag high wowing international crowds as she also represented the VI at the Miss Universe Pageant in 2013 where she represented well. She was also crowned Miss Caribbean World in 2013 and represented at a number of other pageants and shows across the Region. yes it is..sherrie please get a setting where the handicapped can attend, if where u at cant provide for that..thanks! My my ummmmmm. . Shari you are the one. Continue in your quest. This blogger got your back 24/7 365. This is so timely and needed in this community at this time. Best of luck, success and prosperity. Remember your family is behind you 100 % and keep on keeping on. 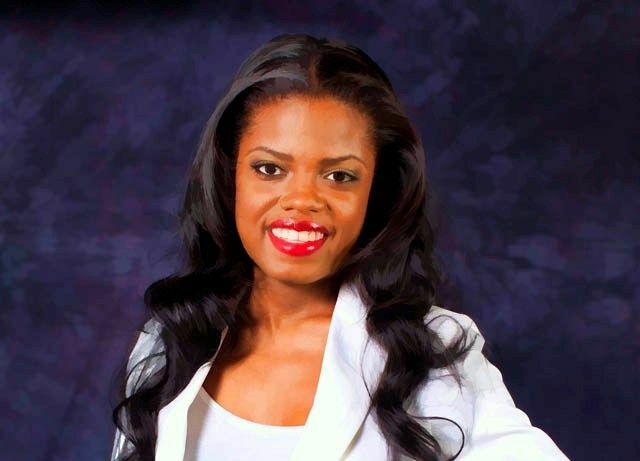 The vip should put up this promising/beautiful/intelligent young lady to run against the likes of claude and alvin. That will be a breath of fresh air and woman power. Let the young lady continue with her passion for teaching our youth and even adults that need it. She is young enough that she can get that going and if she wants to represent the country at a higher level then so be it. The Country needs more young people that are willing to give back and not complain. See? She saw issues at the school and instead of playing politics, she got up and did something about it. This is highly commendable and I will personally get in touch with her to see how I can assist with the program. Now I hope people realize how much work there is to be done at our Public Schools in particular and leave the politics out of it. We need SUPPORT not CONFUSION. Good luck and all the best Shari, this story truly warmed my heart! I am so proud of you sharie!!! Never give up on something you can't go a day without thinking about. This is your calling and passion, with god behind you no one can stop you..
Great, maybe they should also teach English Grammer, I hired two new employees that attend the local community college, graduated from high school and their grammer is horrible; like really bad worse than my 3yr old nephew. I have to check their work constantly for errors, very,very sad. The word is spelt grammar, not grammer, sad. To correct someone's work you must know how to spell first! Right, their "grammer" is horrible but how is their "grammar" lol! Congratulations Shari, great initiative, God bless you. Thank you Sharie for this and best wishes. Now can someone please give us an update on where the new Library will be erected and how long will it take to becoming a reality. It is all good we are providing literacy services and encouraging reading, however we need a clean, quiet and wide variety of books to expand our Minds. Let us put the LIBRARY on the PRIORITY LIST!!!!!! Please! Thank you for bringing this very serious issue to the forefront. As a society, I don't think we realize how many our children are quickly becoming functioning illiterates. I wish you well in this very bold move. Blessings. Shari, you are an amazing young woman. Very timely initiative and should be supported by the entire community from top to bottom. You are greatly gifted, particularly blessed and have been chosen for such a time as this. Always remember that the Almighty has spiritual scissors working for you so only be strong and courageous. I just said to my brother the other day that while we continue to inundate our children with doing well at academics, what I call the “memory challenge” in our style of education, we will see that at age 18, all other things remaining equal, the most important skill they would have acquired is that of literacy. It informs logic, reasoning, proper speech, writing of a superlative standard and the ability to survive in the real world, where fortunately or unfortunately the “memory game” remains academic. Be blessed and keep God at the forefront of your life. Yeah, yeah, Yeah,yeahhhh! You're the lady Ms. deCastro. I must applaude your efforts, passions, dedication and work ethic, truly commendable. Ms. de Castro, I'm a young college student. U r on the right path to success in helping others who really need it. I must I support what Ayana says. I hope the system will understand what u r doing congrats. This is an awesome initiative being implemented by Ms DeCastro, I truly applaud her. My wish is that her programme becomes a success and the benificiaries her testimony..Good luck Sharie and God's blessings and guidance be with u always. Awesome young lady!! God fearing and caring. Wish you much success! I admire you for doing that. How can I get in touch with you. Wow!! what a vision!! It's only God that could have given that to you! And your point being?? If you have nothing nice to say about this very beautiful, intelligent and humble young Lady please don't have nothing to say at all. AMAZING BLACK YOUNG WOMAN! Keep up the good work in the community my darling. keep the up the work u are doing Sharie! !>>>>>.......Your the best English Teeacher!!!! What is your contact information so persons can sign up? Heard after years of begging he finally give Steve p a job as a PE Teacher but that would not last!. The education system is doom under mvw until the next elections and that’s a fact!!! HALOS to Sharie and very high commendations for her parents who invested immensely in her educational development. I've always been very proud of your accomplishments. 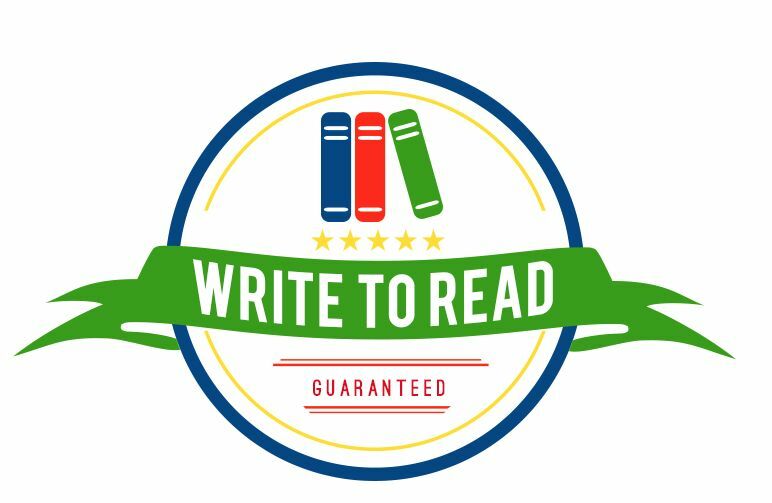 Good luck and best wishes in your quest to promote literacy; you are right on target with your initiative. In years to come, the Virgin Islands will be a better place because of your contribution. Continue to carry your scissors (as most teachers do);but most of all walk with God, and He will carry you through. Although you are entitled to your own opinion, I disagree with your comment. People like you need to pump your breaks and Think before you speak. Shari represented well as miss Bvi but she isn't the best miss bvi. That type of comment isn't necesary. There is no such thing as the BEST ms BvI. Miss Bvi goes way back from 1954....even before you were born I'm sure, so have some respect for ALL miss Bvi queens please. Nonethess I wish Shari success in her new venture and may she continue to shine and touch lives positively.